Oh yes, Here are the newest, "bestest", styles in plush fleece today! Whether you want a warm loving appearance, or just want to be cozy warm, these coats are as great to look at, as they are soft to wear! 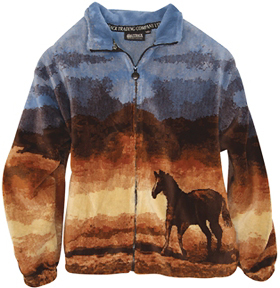 By the way, Outback Trading Co. does not cut quality on your cowgirl coat fashions. Luxury thick pile fleece. Same great zippers, fasteners, embroidery, styling... But place your orders early. We hate it when we have to say they are all gone; especially right at Christmas. 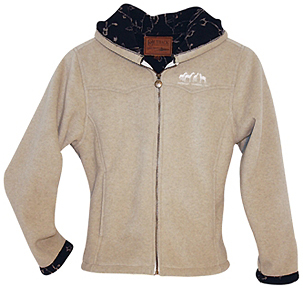 A luxurious polyester fleece wraps your body in comfort. Fun and flirty too! Western Yokes. Nicely contrasting hood and cuff linings. 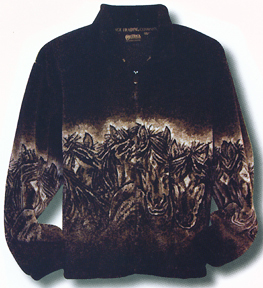 Famous Outback Ponies embroidery. Smooth outside/mini-berber inside. Princess seams. Side entry pockets. Colors: Winter White (shown above), White, Cobalt Blue, Black, Fawn (shown above right). Double layered fleece offers lightweight warmth. 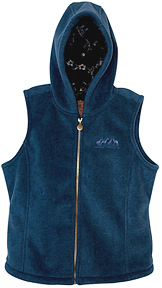 Smooth 100% Polyester Fleece outer with mini-berber fleece lining. 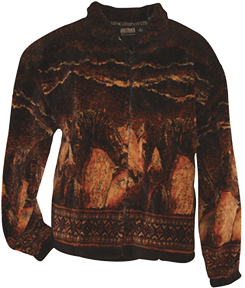 Famous Outback Ponies embroidery. Princess seams. Side entry pockets. Zipper front closure. Cobalt Blue shown above. Scenic Fleece Coats - Unisex sizing. Comfortably warm. Stylish. Very Horsey! 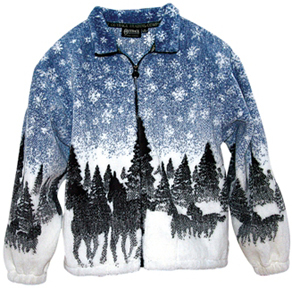 Durable layered fleece offers lightweight warmth. Smooth 100% Polyester Acrylic Fleece outer. Side entry pockets. Zipper front closure. Elastic cuffs and drawstring waist keep the cold out. Sometimes, in the South, we have to wear a little "snow" to remember what it is! Remember galloping your horse through a snow-covered field! Looks like my herd at feeding time! Can we ever get enough of our love for horses? Help weather proof your coats. 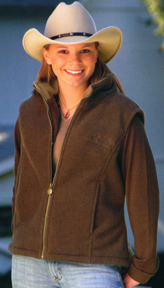 These fleece jackets can be assisted by using several coats of Scout Brand Rain & Stain Protector. Spray, let dry. Brush fleece another direction. Spray again. Repeat a couple more times and make your garments more water resistant in snow and easier to clean in mud. Remember the key is several lighter coats. Retreat after washing.